It's no surprise that October is one of my favorite months. Cool weather, bright colored leaves, pumpkins, cider and everything else fall. Another reason I love October? Halloween, of course! It's not the dressing up that I'm a fan of - I could do without it. What I do love is eating candy, cuddling up under a blanket and watching scary movies. While I may have nightmares for a night or so, there's nothing better than being spooked on All Hallows' Eve. 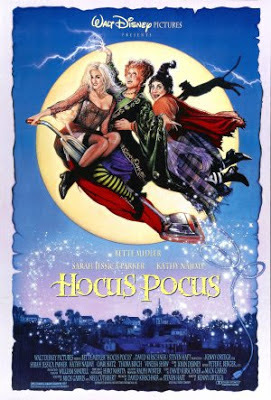 And tonight, I'm watching one of my favorite Halloween movies, Hocus Pocus. While I'm not entirely certain it should have been labeled a children's movie, it's one of my favorites none-the-less. If you haven't seen it yet... well, I can't even begin to explain how wrong that is.